A journey through history, starting with the famous legend of the sirens that have bewitched Odysseus, relaxation and fun; here's what awaits you in Sorrento. 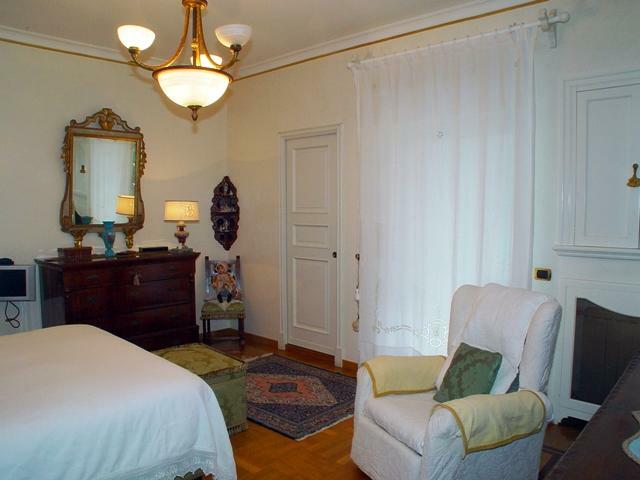 And what could be the ideal place to stay if not Cori House Sorrento, a luxury apartment with sea view located in the heart of the city of the poet Torquato Tasso . 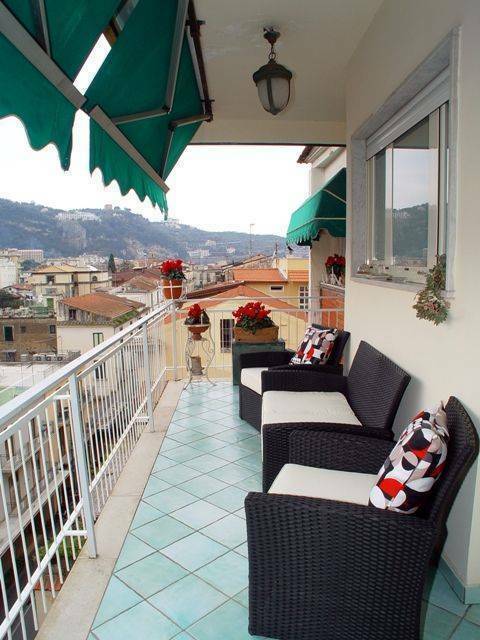 The apartment Casa Cori Sorrento it is situated on Corso Italia, the main street of Sorrento at 30 meters from the main square (Piazza Tasso), near restaurants, bars, supermarket, backs. A car is not necessary because the SITA bus stop (from where you can go to Positano, Amalfi, Ravello, Sant'Agata Sui Due Golfi, Massa lubrense) and the Circumvesuviana train station (from where you can go to Pompeii and Naples) are at 50 meters away. Marina Piccola, the port of Sorrento, from where you can take the boat to the Islands Capri, Ischia, and Procida and to Naples, Amalfi and Positano is at only 700 meters away. For ho has a car can park it in the private garage. The beach facilities are located about 700 meters away. The park has gardens which lead you to the sea (for the lazy ones there is the possibility of taking the elevator) and from there you can enjoy a magnificent view of the Gulf of Naples, from the island of Procida to Mount Vesuvius. You can also enjoy a walk along the elegant main street Corso Italia (with its shops and the famous ice cream parlours) and the historical centre with its typical shops from where you can buy souvenirs of all kind. 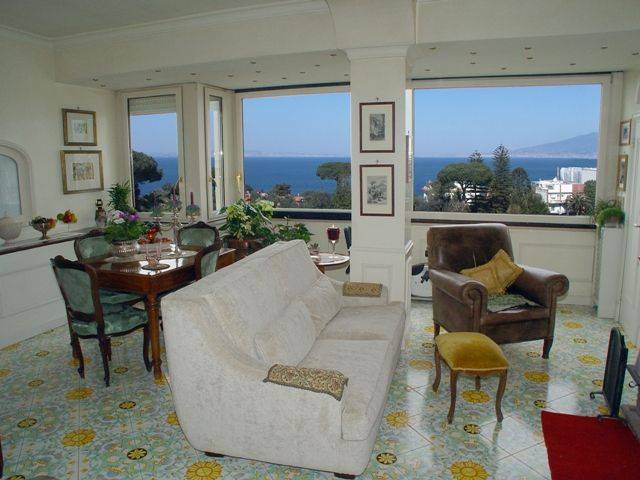 Casa Cori Sorrento has 105 square meters and can host up to 4 people, has 2 bathrooms, air-conditioning, wireless connection, private parking and splendid view of the Bay of Naples. 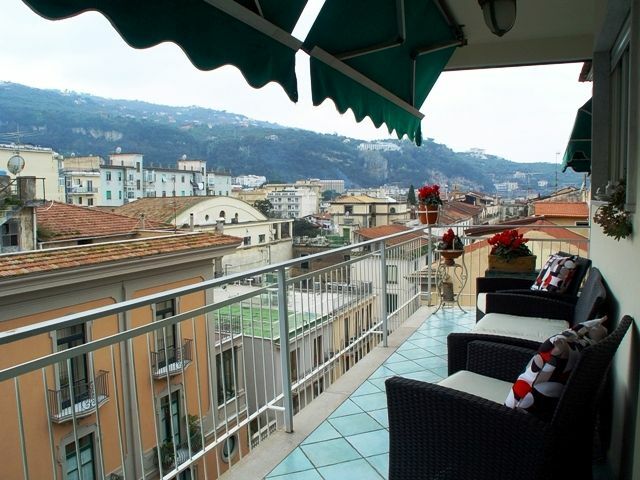 The apartment is on the fifth floor of a building (with elevator) right on the main street of Sorrento, called ‘Corso Italia'. You will enter a parlor (furnished with fine taste) from where you can go either to the living room as well as to the bedrooms. The living room area consists of a spacious and bright living room (with glass walls giving fantastic 180 degrees view of the Bay of Naples) with first class furniture, and of a modern kitchen with sea-view. The living room provides you with full comfort: there is an antique fire-place, satellite television with LCD screen and even a corner with in-door bike facing the window for those who want to get a bit of exercise while enjoying the fascinating sea-view. 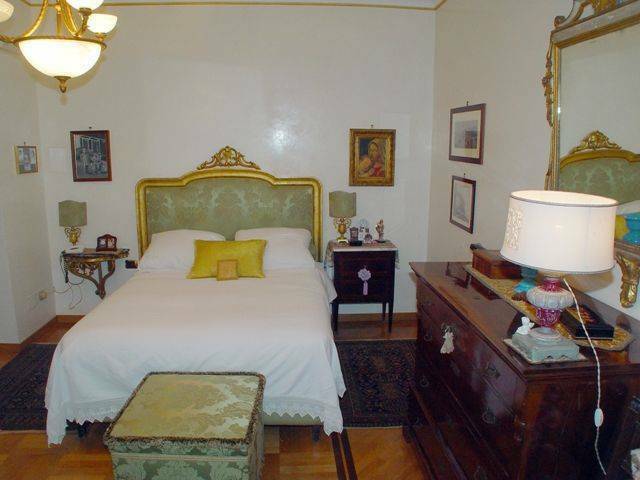 There are 2 double bedrooms with double beds and 2 bathrooms (one with hydro-massage shower and the other with tub and hydro-massage shower too). 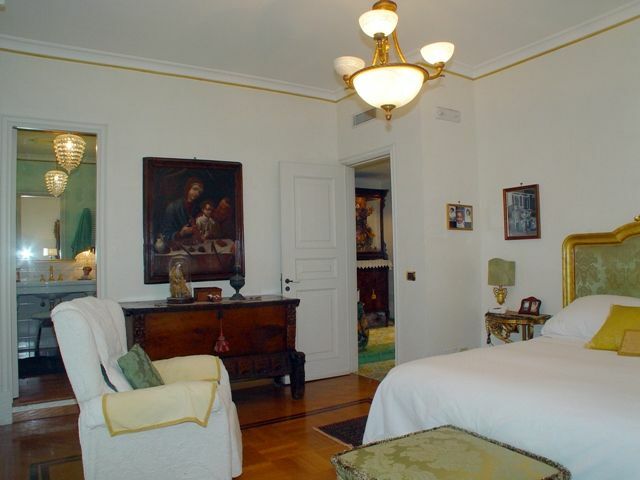 One of these bedrooms has got access to the terrace (with couches and chairs) that provides view of all the main street and of the main square of Sorrento. Sea view, Charming surroundings, Museums, Restaurants, Ruins, Winery tours, Cinemas, Churches, Beach. Diving, Swimming, Tennis, Walking, Sailing, Cycling, Fishing, Horse riding, Water skiing, Wind-surfing. The closest beaches are in a 700 meters distance, just as the port, from where ferries depart to the islands of Capri, Ischia and Procida. (It is also possible to rent a boat of any size, with or without mariner to enable you to enjoy the coastal waters freely). Characteristic shops, typical restaurants, bars, banks, boutiques are all nearby your house.